I agree, I have taken Liberty Creek Merlot and put it in bottles of super expensive Merlot's, and served it to my Wine Snob friends here in Tampa. They raved about it, and were shocked when I told them what Wine they were really drinking. 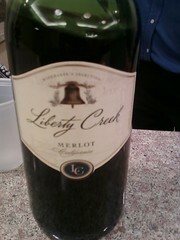 Liberty Creek Merlot is the promise of California fulfilled. Great tasting Merlot for everyone, at an affordable price. Thanks for agreeing on its rating and for checking out our weblog! Looked at review before opening bottle...friend bought it for me. Maybe I should have tasted first. A light merlot with a lot of fruit flavor. More so than any other merlot I've tried. Very good. Thanks L.C. Frazier, we still like this and other Liberty Creek wines,too. Appreciate stopping by and checking out our weblog! I looked this review before purchasing. I will let you guys know how it tastes! Yah, the wine is good. I'm not a wine snob but most cheap red wines have a rubbery aftertaste. This one is clean. It also has a pleasant fruity taste. I recommend! I normally can't stand the taste of any kind of red wine. A friend purchased this for me and I was pleasantly surprised. Will definitely continue to buy this brand, it's wonderful!